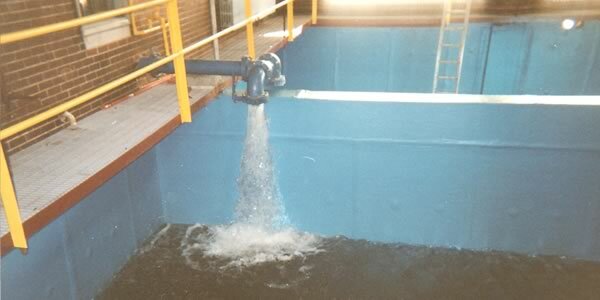 What do you do when the existing lining in your water plant clearwell no longer provides the containment protection for which it was designed? This problem recently presented itself to the Springdale Borough Water System, in Springdale Pennsylvania; and Bill Cadamore, Operations Foreman, knew the exact approach that he wanted to take. Cadamore needed a new lining for his two 84,000 gallon concrete clearwells. The 18-inch thick reinforced concrete tanks were originally lined with a coal tar epoxy and during clean out, de-lamination and spalling was creating a maintenance problem. 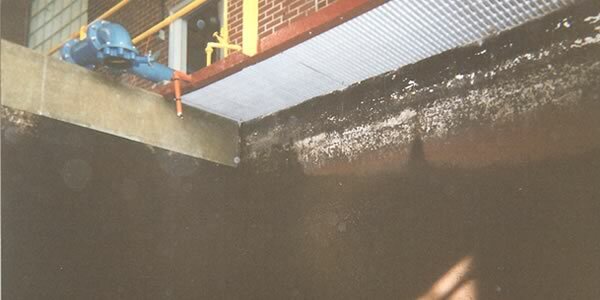 He wanted a system that would offer corrosion resistance, meet AWWA standards, provide total containment, low maintenance and be pleasing to the eye. The new lining must also allow the clearwells to run independently and form a tight seal to the 12-inch stainless steel butterfly valve connecting the two tanks. It must be installed with minimal downtime, tank volume modification and most importantly, minimal operations disruption. With the parameters for the lining system set, Cadamore contacted Chautauqua Fiberglass & Plastics to discuss the possibility of a new fiberglass reinforced plastic (FRP) lining for the clearwells. The Springdale plant had great success with FRP softener tanks and FRP grating, and if an FRP lining was available, he was interested. Mike Dunkerley, president of Chautauqua, met with Bill Cadamore, Jim Dugan, Borough Water Chairman and April Winklmann, Borough Secretary/Treasurer and suggested the Chautauqua HL-922 Fiberglass Lining Systems. The HL-922 system consists of a combination of prefabricated and hand lay-up FRP panels, applied at 0.25 inches to all concrete surfaces including wall penetrations, pylons, and mechanical supports. Materials Design Evaluation, Inc., an engineering firm specializing in the design and analysis of FRP; was contracted to develop a specification for this particular installation. Chautauqua then, with assistance from Senate Engineering Company, and the borough’s consulting engineers, presented their proposal to the Springdale Water Authority in early August 2001. On August 29, 2001 the clearwell lining project was awarded, via open bid, to Chautauqua by the Allegheny Valley North Council of Governments through Community Block Grant Program. Hydroblasted all surfaces to remove existing coal tar epoxy and all loose concrete. Repaired all concrete voids and cracks with Chautauqua HL-922 Fiberboard Filler and level substrate creed or trowel. Applied 2-inch FRP strips on 3 feet centers to walls using mechanical anchors. Installed prefabricated 4 feet by 8 feet FRP panels to the walls using mechanical anchors. Joined panel seems with FRP hand lay-up lining. Lined tank floor and joined to walls using FRP hand lay-up method. Visually inspect for voids, steam cleaned and filled. In addition to the HL-922 System installation, Chautauqua provided core drilling, installed steel pipe sleeves lined with FRP, and connected the clearwells with a 12-inch butterfly valve. They also set a new FRP lined drain and coated all mechanical supports and piping. Two 12-foot FRP ladders were installed for easy access to the tanks. The total outcome now provides Springdale Borough with an attractive, durable lining system that will provide total containment and low maintenance for many years to come. Advances Fiberglass Services, formerly, Chautauqua Fiberglass & Plastics, Inc., located in northwestern Pennsylvania, provides fiberglass reinforced plastic linings, chemical tanks, equipment covers and housing, platforms and ladders, grating and odor-control grating plates to the water and wastewater industries.